The day after Halloween I suggested that Felix pull out his briefcase full of trick-or treat candy. I thought we’d use it to do some second-grade math. Or maybe I just wanted to see it all again. “You can’t take any…” he said distrustfully. He had caught me and Oz pilfering the previous night. We got out paper and colored pencils. He separated and sorted the candy into groups. Four-year-old Buttercup counted it outloud, and Felix practiced his tally marks. Then we made graphs and colored in the squares with corresponding candies: Skittles, Crunch bars, Reeses, Butterfingers, Lollypops, M&Ms. Of course, the whole time, they were begging for a piece. I know this constitutes a bribe, but I had to use the leverage while it lasted. After we ate our pieces (they shared with me! 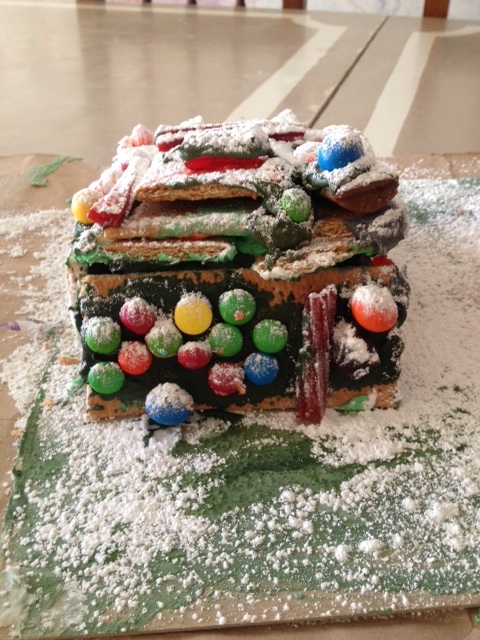 ), Felix carefully arranged the candy back into the briefcase. I grinned, remembering how my brother and sister and I used to play with our candy like toys, arranging them on the carpet like little cars and houses and neighborhoods. It is rather aesthetically pleasing, after all. Not the chocolates, which look like little turds, but the Skittles and M&Ms and hard candy that look like colorful pebbles and gems. 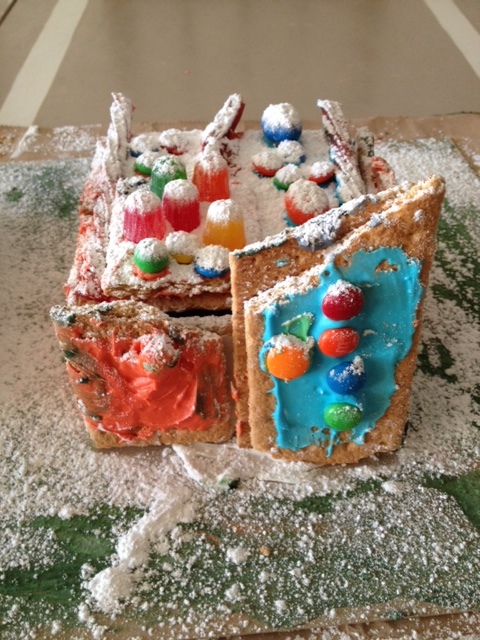 I’m not the least bit crafty, but I had seen something online about making Gingerbread Houses out of graham crackers. I still had half a bag of confectioner’s sugar left over from an old birthday party. The kids were game because it meant going out and buying graham crackers and food coloring, which rarely make an appearance in our house. We got back from the store in high spirits and whipped up a batch of thick paste with powdered sugar, egg white, and cream of tartar. I was thrilled! I’ve always wanted to build my own house! But soon we ran into “issues.” Buttercup’s graham crackers (poor construction material) kept crumbling apart under her tight grip. Those had to be eaten. Mine wouldn’t stick together (rough edges) without huge, unattractive gobs of paste. Felix only managed to get his to stand by using an empty tofu container as a little scaffolding. We were anxious to start the exterior decorating—that was the whole point, after all—but our units kept collapsing like card houses. Then it occurred to me that they might do better with a foundation. So I slathered a huge pile of hardening paste on to a piece of cardboard and mired our houses in it. They stuck! We went off to watch Wild Krats, and when we returned, the houses were dry enough to decorate. I mixed up another batch of paste and the kids had a great time with the food coloring, creating odd blends of “chartreuse” and “aquamarine” and “evergreen” and “blood red” and “brown.” We slathered it on like plaster with our fingers, feeling like old-world craftsmen. It dried quickly, so we had to work quickly, “as a team” to adhere the baubles. That was the most fun. When we were finished, they looked like trashy little mobile homes in a trailer park. I added a little bit of water to the colored pastes and smeared some landscaping on to the cardboard; sifted some confectioners sugar over the top like snow. Whallah! Now they were gorgeous little pueblos with vigas and latillas in the Sangre de Cristo Mountains! I was ebullient: I had reduced their cache of candy by approximately half, and it had only cost me one piece of candy each! “This is the best day of homeschool—ever! !” Felix cried effusively. They only problem was that Buttercup kept disappearing—numerous times—under the table to lick her fingers. And some of the candy had gone missing. When Oz came home that night, he admired them and uttered the unmentionable: “When do we get to eat them? “Why?” they all wanted to know. They started at me with identical expressions of shock. What? Don’t kids love to destroy things? I would have loved that! “–And then you can each have one piece of candy, I added lamely. “Can we put the pieces in a bag and take them to Mexico?” they wanted to know. He found the briefcase in a few moments and carried it back to the living room held over his head like a prize-fighter. Felix’s face collapsed–not because Oz had found it–but because the contents were completely jumbled now. “Do you know how long that took me to arrange?” he wailed. Buttercup began to cry in solidarity, and within a few seconds they were both heaving and sobbing in unison. The previous night, when we had devoured their Halloween candy under their noses, it, hadn’t elicited such a violet reaction. I tried not to laugh: they were in genuine, misguided emotional pain. “Daddy can put it back together!” I tried to assure them. “It will never be the same. Never, never, never!” Felix cried hysterically. Oz and I looked at each other grimly, thinking the same thing: We did this to our kids. We allowed this to happen. That’s what you get, playing with sugar. This entry was posted in Uncategorized and tagged alternative, candy, crafts, Halloween, homeschooling, mothering, parenting, sugar sensitivity on November 13, 2013 by Lillian Gilmour.